Check out our 360 virtual tour! Click on the arrows to move around. #1 Bed and Breakfast in Pagosa Springs since 2011 on TripAdvisor. Conveniently located just 2.5 miles from downtown Pagosa Springs, 5 minutes from the Hot Springs, and only 25 miles from Wolf Creek Ski Resort our 9-acre inn in Pagosa Springs features an enchanting log home with old fashioned, wrap-around porches. We are close to town amenities but away from the crowds with spectacular 180 degrees' breathtaking views of the San Juan mountains. At Elkwood Manor every guest is a VIP. All five king suites have fireplaces, air conditioning, flat screen TV, refrigerator, private sitting area and private bathroom. Free wi-fi and DirectTV is available in every suite. Looking for a wedding venue in Pagosa Springs? Elkwood Manor has the perfect backdrop for a simple and elegant countryside wedding. Our wedding packages are tailor-made to the bride and groom's wishes and budget. It's your wedding, we follow your lead! Our rates include a full and beautifully presented breakfast as well as happy hour every evening with cocktails, wine, beer and appetizers. Our Pagosa Springs inn is cozy and comfortable and the views are breathtaking. The hot tub under the stars is available 24-hours and fluffy robes are provided for your comfort. Elkwood Manor Bed & Breakfast provides the ideal location for those seeking a special place to reconnect with nature and enjoy all that it has to offer. The grounds induce serenity and the surroundings offer you the opportunity to refresh your spirit, restore your energy and reconnect with what means the most to you. This is what vacation is all about! 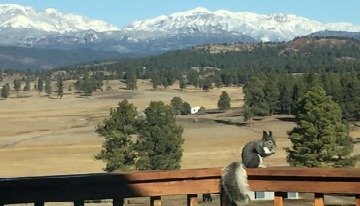 Each season shows its full beauty in Pagosa Springs, the perfect place for outdoor activities. Enjoy hiking, fishing, rafting, biking, many forms of skiing, four-wheel drives, snowmobiling and a variety of scenic drives. With an average of 300 days of sunshine and four definitive seasons, Pagosa Springs is an extraordinary place to visit all year around! We invite you to come to Elkwood Manor, discover our hospitality, friendly atmosphere and accommodating attitude. Elkwood Manor's panoramic views and the natural beauty of the San Juan Mountains create the ideal backdrop for the perfect Countryside Wedding. Whether you are planning an intimate small wedding or a larger celebration party we will follow your lead and take care of every detail making your country wedding or event a memorable experience. Lots of fun? Peace and quiet? Have both. Only a couple miles from all the shops and restaurants in downtown Pagosa and yet in the peace and quiet of the mountains. 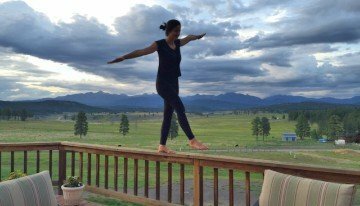 Book now to enjoy this special season in Pagosa Springs! With our Spring Special you get 15% off room rates. You also get a free dinner when staying two or more nights with us. Click here to book now with coupon code SPRING for stays between April 1st and May 31st 2019.